The study offers the first reliable method for tracing viral evolution back to a time when neither viruses nor cells existed in the forms recognized today, the researchers say. Until now, viruses have been difficult to classify, said University of Illinois crop sciences and Carl R. Woese Institute for Genomic Biology professor Gustavo Caetano-Anollés, who led the new analysis with graduate student Arshan Nasir. 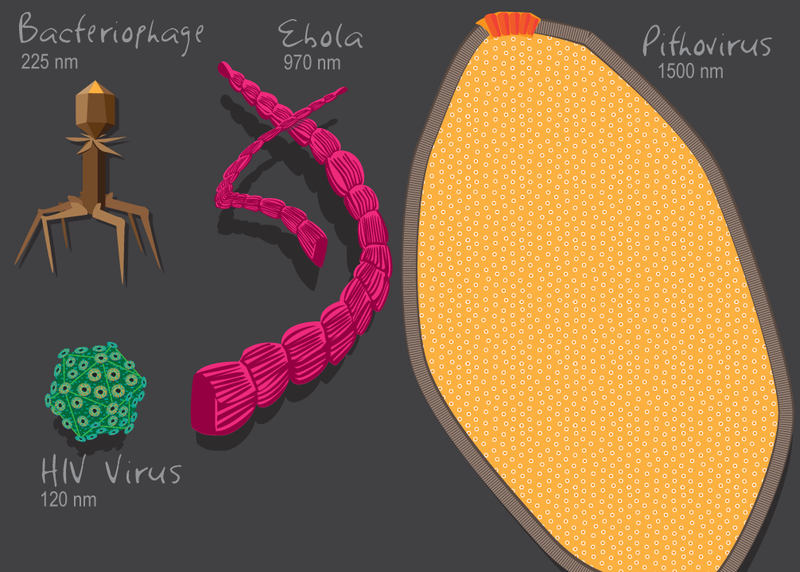 In its latest report, the International Committee on the Taxonomy of Viruses recognized seven orders of viruses, based on their shapes and sizes, genetic structure and means of reproducing. Part of the confusion stems from the abundance and diversity of viruses. Less than 4,900 viruses have been identified and sequenced so far, even though scientists estimate there are more than a million viral species. Many viruses are tiny – significantly smaller than bacteria or other microbes – and contain only a handful of genes. Others, like the recently discovered mimiviruses, are huge, with genomes bigger than those of some bacteria. The new study focused on the vast repertoire of protein structures, called “folds,” that are encoded in the genomes of all cells and viruses. Folds are the structural building blocks of proteins, giving them their complex, three-dimensional shapes. By comparing fold structures across different branches of the tree of life, researchers can reconstruct the evolutionary histories of the folds and of the organisms whose genomes code for them. The researchers chose to analyze protein folds because the sequences that encode viral genomes are subject to rapid change; their high mutation rates can obscure deep evolutionary signals, Caetano-Anollés said. Protein folds are better markers of ancient events because their three-dimensional structures can be maintained even as the sequences that code for them begin to change. Today, many viruses – including those that cause disease – take over the protein-building machinery of host cells to make copies of themselves that can then spread to other cells. Viruses often insert their own genetic material into the DNA of their hosts. In fact, the remnants of ancient viral infiltrations are now permanent features of the genomes of most cellular organisms, including humans. This knack for moving genetic material around may be evidence of viruses’ primary role as “spreaders of diversity,” Caetano-Anollés said. The researchers analyzed all of the known folds in 5,080 organisms representing every branch of the tree of life, including 3,460 viruses. Using advanced bioinformatics methods, they identified 442 protein folds that are shared between cells and viruses, and 66 that are unique to viruses. In fact, the analysis revealed genetic sequences in viruses that are unlike anything seen in cells, Caetano-Anollés said. This contradicts one hypothesis that viruses captured all of their genetic material from cells. This and other findings also support the idea that viruses are “creators of novelty,” he said. Using the protein-fold data available in online databases, Nasir and Caetano-Anollés used computational methods to build trees of life that included viruses. The data suggest “that viruses originated from multiple ancient cells … and co-existed with the ancestors of modern cells,” the researchers wrote. These ancient cells likely contained segmented RNA genomes, Caetano-Anollés said. Some scientists have argued that viruses are nonliving entities, bits of DNA and RNA shed by cellular life. They point to the fact that viruses are not able to replicate (reproduce) outside of host cells, and rely on cells’ protein-building machinery to function. But much evidence supports the idea that viruses are not that different from other living entities, Caetano-Anollés said. The discovery of the giant mimiviruses in the early 2000s challenged traditional ideas about the nature of viruses, Caetano-Anollés said. Some giant viruses also have genes for proteins that are essential to translation, the process by which cells read gene sequences to build proteins, Caetano-Anollés said. The lack of translational machinery in viruses was once cited as a justification for classifying them as nonliving, he said.